Temperature and wind chill can be displayed in °C or °F﻿. 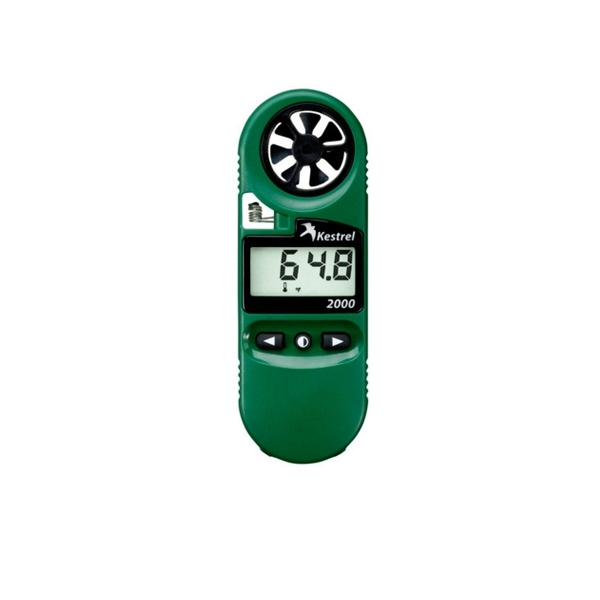 Capable of measuring the slightest breeze, the unit uses an ultralight impeller mounted on jewel bearings to measure wind speed and provide an accuracy of ±3%. 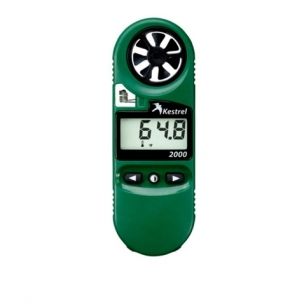 For temperature readings, the Kestrel uses a fast-responding, hermetically sealed thermistor accurate to ±1°F (±1°C). Wind chill factor is calculated automatically from wind and temperature data using the U.S. National Weather Service’s official tables﻿. Measuring modes and display units can be changed at any time. Results are displayed on a large, easy-to-read LCD which automatically shuts off 45 minutes after last key press. The Kestrel 2000 is housed in a reinforced fiberglass case which is waterproof and floats﻿. A convenient neck lanyard and one CR2032 battery are included. Two-year manufacturer’s warranty﻿. · Minimum wind speed: 0.7 mph (0.6 knots, 1 km / h, 0.3 m / s or 60 fpm). · ﻿Maximum wind speed: 89 mph (78 knots, 144 km / h, 40 m / s, or 7.830 fpm). · ﻿Wind speed accuracy: ± 3%. · ﻿Temperature and wind chill accuracy: ± 1 ° C.
· ﻿Temperature Resolution: ± 0.1 ° C.
· ﻿Wind chill factor resolution: ± 0.1 ° F (± 0.1 ° C). · ﻿Operating temperature: -4 ° F to +140 ° F (-20 ° C to +60 ° C). · ﻿Temperature range: -20 ° F to +158 ° F (-29 ° C to +70 ° C). · ﻿Temperature sensor: Precision thermistor hermetically sealed. · ﻿Sealing: Electronics enclosure IP67 - water resistant to 3 ft. Floats. · ﻿Battery: user-replaceable CR2032 coin cell battery with a typical life of 400 hours. · ﻿Dimensions: 4.8 "x 1.7" x 0.6".